Hope you are eating lots of lovely chocolate. 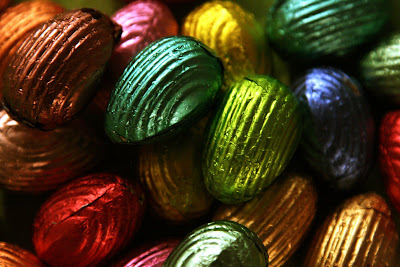 Somehow the chocolate in Easter Eggs is more addictive than usual. Something to do with that brittle thin shell and the way it cracks. I lurve my choccies. Can't do without them anytime no just Easter. Happy Easter. Happy Exploring. Mmmmmmmmm.......... they almost look tooooooo good to eat. Oh yummy! I just had a few pieces from the stash and now I want more! Happy Easte! Have a wonderful trip! Beautiful. Makes you want to dive right in. I like the Easter photo, but it is making me hungry for some chocolate!